NOTE: This content is old - Published: Friday, Jan 15th, 2016. Wrexham Football Club has recorded something more valuable than 3pts, with a net profit recorded for the first time since becoming fans owned. 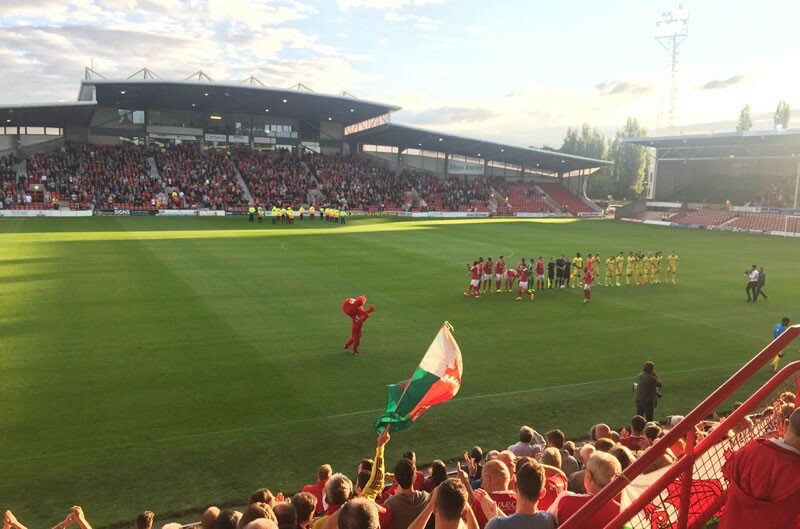 Wrexham Association Football Club have announced that it made a net profit of £11,587 for season 2014/15, the 150th anniversary season of the supporters’ owned club, and the first time the club has posted an operating profit in 15 years. The announcement has been made ahead of the fourth annual general meeting of Wrexham AFC Limited that will take place at the Catrin Finch Centre, Glyndwr University Wrexham at 7:30 pm on Wednesday. All paid up members of Wrexham Supporters Trust are entitled to attend the AGM as owners of Wrexham Association Football Club where a full presentation of the financial results will be made along with a trading update of the current season financial performance with new Club Members also able to join on the night. These results mark a large turnaround from the bleak events and finances of the last decade, with the Crusaders being put out of business once by the same owners who sold Wrexham FC for a pound shortly after. Fans took over the club back in 2011 with the club being sold for just £1 after a protracted period of difficulty with several owners appearing more focussed on the stadium land rather than the football club. As we noted at the time revelations revealed the true cost of purchasing the ‘club for a quid’ , as it seems for that pound coin the WST took on debts in the region of half a million pounds plus a club making an ongoing loss. Overheads and wages were reported at running at 131% of income. The previous owners have been highly criticised locally and nationally as the club had at one point owned their own ground, which was then split off for the student development. The student development was opened with much fanfare, however the development has stalled with the remaining land now being sold off. The area behind and slightly including the Kop stand, now branded development land, has been subject to focus of unkept planning promises, and more recently being branded an ‘eyesore’. The student development itself was given the green light by local Councillors who in 2009 favoured the plans declaring it a ‘gamble’ citing advice from Council Officers. To take the local members betting analogy forward to 2016 it appears the property developers are attempting to exit the game by cashing out, with today’s financial results indicating the wrong horse was backed by those in the Guildhall back in 2011. Despite enquiries there is no detail of the findings or existence of that ‘probe’.